The powerful ES1000 payroll recorder totals hours - including overtime totals - for up to 100 employees, with automatic meal time deductions. No need to spend time calculating hours by hand - employee hours are totaled automatically. Even overtime totals are easy to read, saving you payroll preparation time. Two-color printing makes early and late punches easy to identify. The clock requires the use of ES1010 time cards. Accomodates up to 100 employees. Supports multiple pay period options: weekly, bi-weekly, semi-monthly or monthly or you can configure for job-costing. Optional NiCd battery pack allows employees to clock in and out even during a power outage (up to 200 punches). 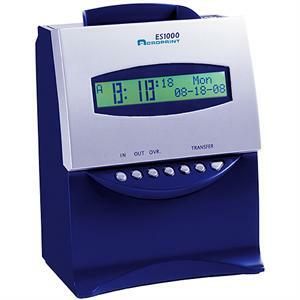 Handles calculations using either exact or rounded time..
Can control signals for external bells and horns to signl break time or end of shifts. Requires the use of ES1010 time cards. Number of Employees: 100 max. Dimensions: 9.25" x 7" x 5.25"